While I’m at it regarding posting old photos, here is one that I believe has heretofore never seen the light of day. After shooting the roll back in 1998 I never did anything with it other than to make a contact sheet. 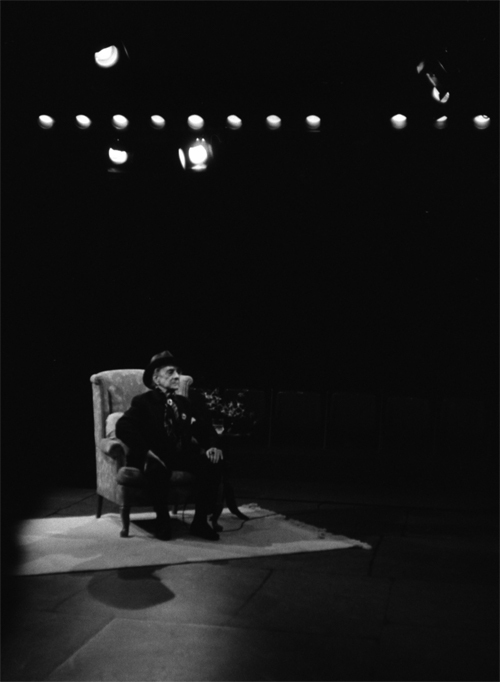 a clothed Naked Civil Servant – Quentin Crisp at Stages Repertory Theatre in Houston, December 1998. Having said that, I do still enjoy his performance in Orlando. This entry was posted on Monday, November 30th, 2009 at 10:07 pm and is filed under History, Non-ENDA. You can follow any responses to this entry through the RSS 2.0 feed. You can leave a response, or trackback from your own site.